Brassens had earlier composed a song, “Ballade des dames du temps jadis”*, based on a famous poem by François Villon, (c. 1431-c. 1463), which spoke of great figures of ancient legend and myth and also of more recent French history who had come to personify a romantic vision of grandeur now forever lost. In this song, Brassens describes his personal down to earth experiences of love and beauty, ironically enjoying the absence any sense of glory and social status in the exuberant promiscuity of his life without pretension. "Je te plais, tu me plais... viens donc beau militaire..."
Margot, la blanchecaille, et Fanchon, la cousette..
Sire, you get ladies of yore, that you're able to. In springtime Cupid turns all wood into arrows. And grand sentiments were not expected of you. « You like me, I like you… come on then my fine fellow. There was no need even to bring your heart along. It was Psyché in full splendour who bedazzled you.. But you didn't run and top yourself just for that. And, in that, love found satisfaction all the same. 3) excusez-moi du peu, - . "peu" of course means "little", but the straight translation "forgive me for the little" is obviously unsatisfactory. Sometimes, however, the word is better translated by an expression of inadequacy: son peu de comprehension- his lack of understanding. 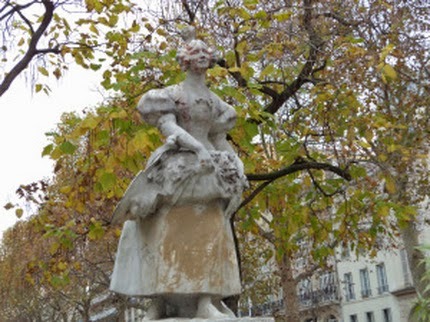 4) Vénus de barrière- Les barrières de la ville were the town gates and these were the less desirable areas of the town where the poorer people lived and worked, with some of the women hanging around to sell themselves. One source tells me therefore that “Vénus de barrière” is an old and literary term for “fille de joie”. A"barriere" area is very much like the one where Brassens spent the happiest years of his life in Jeanne's hovel. The district is described in his song "La Princesse et le croque-notes." 6) Cythère –the Greek island of Kythera. The island of Aphrodite, the goddess of love. 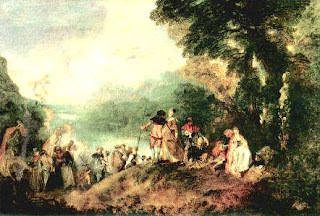 A famous painting by the famous French artist Watteau is called “Embarquement de Cythère (below). 7) Son habit sortait point de l'atelier d'un dieu... The refence to God’s workshop is probably to Hephaestus the Greek god of blacksmiths, craftsmen, artisans , sculptors etc. b. 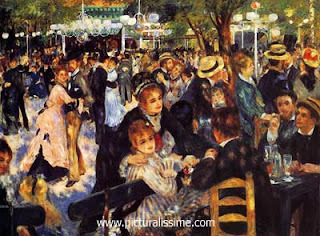 An image of sexual abandon because « jeter son bonnet par-dessus le moulin» means to do a flamboyant action in defiance of convention, particularly on the part of a woman. 9) C'est Psyché tout entièr' qui vous sautait aux yeux –In greek mythology. Psyche is a girl of great beauty, who was loved by Eros. The statue of their kiss is very famous. 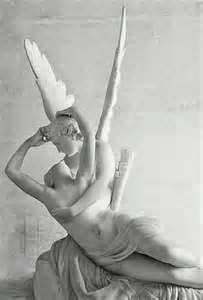 Goethe in a famous poem said that he needed to touch the body of a woman to understand the beauty of the ancient statue. 10) Amazone, Two meanings of this word are (i)Femme qui monte à cheval : (ii)Femme à l'âme ou aux allures virile. As Brassens is talking about jumping, the horse reference would seem apt. 11) “Effeuiller la marguerite”. Wikipedia explains this very well: He loves me, he loves me not or She loves me, she loves me not (originally effeuiller la marguerite in French) is a game of French origin in which one person seeks to determine whether the object of their affection returns that affection or not. A person playing the game alternately speaks the phrases "He (or she) loves me," and "He loves me not," while picking one petal off a flower (usually a daisy) for each phrase. The phrase they speak on picking off the last petal supposedly represents the truth between the object of their affection loving them or not is to play “She loves me- she loves me not”. 12) trouvait quand même son content- The French noun « content » is found in « avoir son content de = to have one’s fill of. Otherwise the English noun “content” is translated by “contentement” in French. Grisettes: The journalist and author Christopher Dickey makes an interesting categorisation of the women in Paris offering love.